You will want S’more of this delicious S’mores pie recipe! No bonfire necessary and this dessert filled with plenty of chocolate, graham cracker, and marshmallow is a recipe to die for! With summer soon coming to an end, I wanted to make sure to savor some of my favorite things about this season in these final few weeks. One of my favorite summer desserts is definitely s’mores and recently on a day off, I decided to make a recipe I have been wanting to try for forever — s’mores PIE. I love s’mores. I love pie. Super brilliant idea. I am obsessed with s’mores anyways (see my Frozen S’mores and my Golden Grahamas S’mores Bars), and it only seemed fitting to present a new way to eat the graham cracker, chocolate and marshmallow combo for the summer. Ooey gooey marshmallows + chocolate + graham crackers? S’mores Pie sounds like summer to me! In anticipation of Labor day coming up next week, I really think you should make this s’mores pie for a less messy version of s’mores, but just as good as the real deal. These would for sure sweeten up your holiday celebration. Gooey s’mores assembled fireside are near unbeatable, but for those times when a campfire or fireplace is out of reach, this s’mores-inspired treat will fill the void……and then some. This pie is soo good and it was gone in an embarrassingly short amount of time. Indulgent and sinful – this is my kind of dessert! P.s. How was everyone’s weekend? I had a nice time making the trip out to Cleveland to visit my brother who just had GI surgery at the Cleveland Clinic. My hubby and I got to visit with him, my mom, and sister-in-law and help boost my brother’s spirits while he’s recovering. He should be going home in a few days hopefully! While we were there, we had dinner and hung out with some friends who live in the area and explored the city of Cleveland a little. So fun! 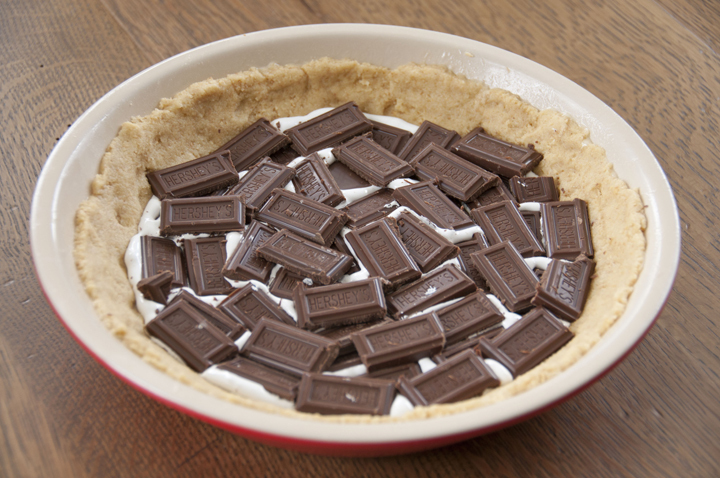 Check out my how-to video of me making the recipe for this S’mores Pie! Be sure to also check out this S’mores Ice Cream Cake from my friend Lori and these No-Bake S’mores Bars from my friend Dorothy. 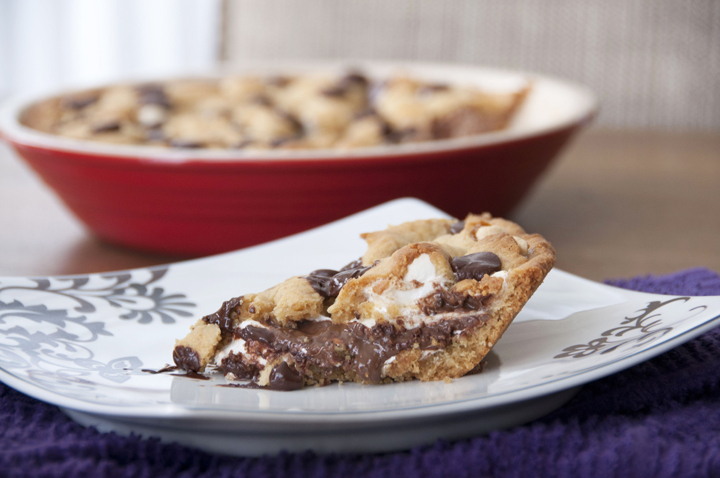 You will want S’more of this delicious S'mores pie! No bonfire necessary and this dessert filled with plenty of chocolate, graham cracker, and marshmallow is a recipe to die for! 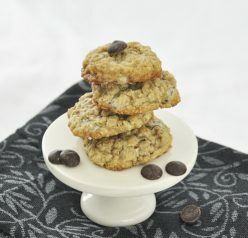 Sprinkle with ¼ cup chocolate chips, then bake 20 minutes until lightly browned. Cleveland is a nice place, glad you had fun experiencing it! I had one of the greatest grilled cheese sandwiches in Cleveland, it still makes me happy to think about! Oh my! These look wonderful! I love the idea of a s’mores pie. So gooey, chocolate-y and delicious! I want a slice NOW! 🙂 Great post Ashley. Thanks, Anne – I appreciate it! YUM! This is so perfect for Labor Day weekend! YUM! Looks so amazing! I’ll have to pin this and keep it in the back of my mind for the colder weather when making s’mores outside isn’t possible. 🙂 I hope your brother heals quickly! I didn’t know that’s where you’re from – I loved it! I had been there once before, but only for a day trip. Yes please let summer not come to an end! Great pie!! Look at all the chocolatey and marshmallow-y goodness! I would love a slice of that now! After posting this I decided I need to make it again real soon! This looks truly amazing! I need to make this, but with vegan marshmallows! 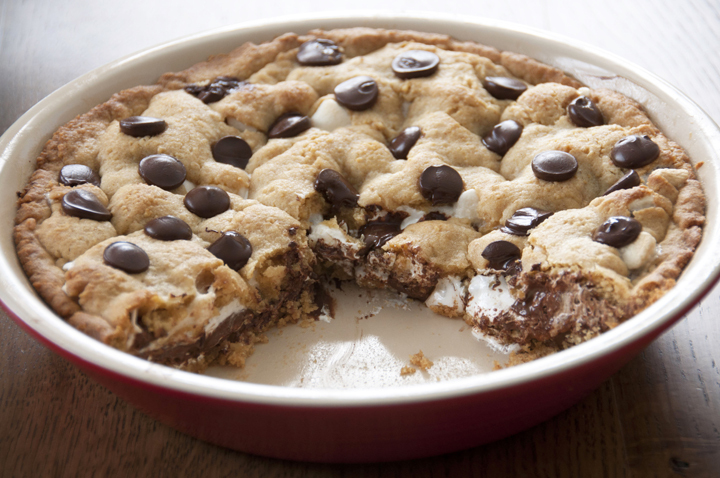 I love anything s’mores and this pie looks amazing! oh my gosh this looks sooooooooooooo delicious Ashley! I would definitely eat the entire pie! Yes, yes and yes… I NEED this! LOL!! I just made it again today for a church meeting. So good! I feel like summer only just begun… so sad. But this makes me super happy! Anyway, thanks for reminding me about s’mores. I think I may be the only one who hasn’t had any s’mores this whole entire summer! So I like totally deserve this pie! No s’mores all summer? I think you need to fix that! This pie looks ridiculous! Look t all that chocolate in the middle! I need to make a small, single serving of this for just me. This has me squirming in my chair with delight! Beautiful! Ummm.. pinned. Enough said. LOVE. I made this yesterday and it’s almost gone today, it’s that good! Was able to grab a quick pic of it before we dug in! Thanks for sharing the recipe. 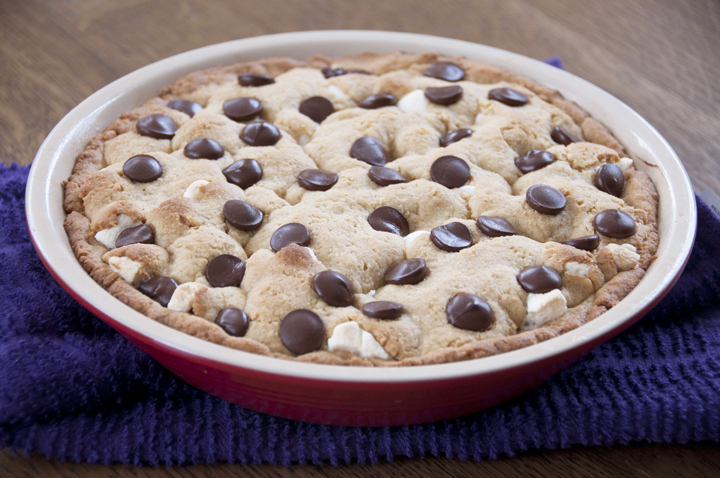 Oh wow, this S’mores Pie definitely captures the best of summer. My kids had been enjoying quite a bit of S’mores this summer and I’m sure they will love this pie. Thanks, Amy! Everyone that has tried this LOVES it! Made this today..it is absolutely the best!! I bet you could use sugar cookie dough that already made 2 rolls would work. Oh I bet that would be great!! Thanks for stopping by, Betsy! 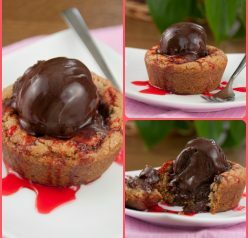 *DROOL* This pie looks soooo good!! It looks better and tastier than what Papa John’s serves for dessert. I want to make this s’mores pie. I love looking at deep dishes such as pies, pizza, etc. Wowww this looks delicious! The top looks so soft and the melted chocolate… sounds absolutely amazing! OMG – I go crazy for smores. Making this soon! It was so nice meeting you at Blog Her Food! Out of all the s’mores pies I have seen I think this is my favorite! 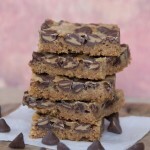 can I use hersheys hot fudge topping instead of harshey bars? I’ve never tried that but I feel like it would get too melty/messy. You can always try – maybe use less though? Like a thin layer? Can I sub regular marshmallows for the crème? I’ve never tried that but you can try! I’m not sure they would melt properly, that’s the only thing. Can The pie be frozen and if yes how do I reheat it, or maybe I can prepare it, leave completely ready and just bake it the day I will serve it? This might be a funny question but does the “Hershey’s Chocolate Bars” are milk chocolate or dark chocolate? Can someone tell me what the crackers are? I’m not in the USA, I’m in Ireland, what would be similar?? Graham crackers are sweetened crackers made with graham (whole wheat) flour as well as other ingredients including sugar and flavorings. You can substitute equal amounts of: Vanilla Wafers, Chocolate Wafers, Crushed Oreo Cookies, etc. I would just cover it well and store at room temperature! I made this and thought it was delicious… The only thing I would suggest is eating it after refiderating it. It was so much better that way! Can you use a Store bought graham cracker piecrust instead of making one from scratch? You can certainly try doing that but it will change the look and the taste of the pie. I’m sure it will still be good! Is marshmallow creme three same as Fluff? Yes it is the same. Thank you! !